Zooming Japan suggested teriyaki (てりやき / a cooking technique in which foods are broiled or grilled while being basted in a marinade based on soy sauce, mirin, and sugar), teppan (鉄板 / a metal griddle or iron plate), and tera (寺 / temple); Japan Australia also suggested tera, as well as tempura (天ぷら / battered seafood or vegetables), tebasaki (手羽先 / spicy chicken wings from Nagoya), and tenmusu (天むす / a rice ball with a battered prawn inside – sometimes called ‘dragon’s tail); lovelycomplex22 also suggested tempura and tera; Haruko-chan suggested temaki (手巻 / a cone-shaped type of sushi), and UK Seikatsu suggested Tetsuwan Atom (鉄腕アトム / Astro Boy by Osamu Tezuka), Tetsuko no Heya (徹子の部屋 / one of longest running Japanese talk shows), Tetsuo (鉄男 / a film by Shinya Tsukamoto), tengu (天狗 / a goblin-like creature), tempura, tekkadon (鉄火丼 / a sushi bowl topped with tuna sashimi), and temari (手鞠 / an embroidered ball used as a toy). Ah… tebasaki! 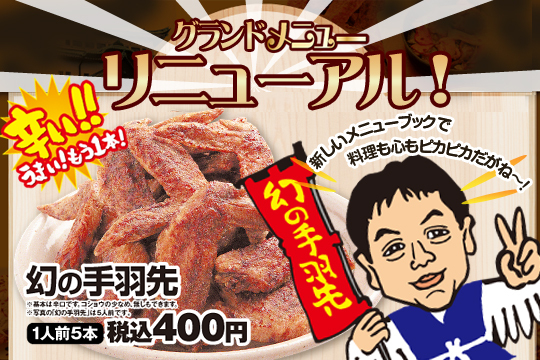 I have such fond memories attached to tebasaki (手羽先) simply because these spicy chicken wings come from my ‘hometown’ Nagoya (名古屋), in Aichi Prefecture (愛知県). I arrived in Japan willing to change my veggie ways and eat fish, but before very long I realised I would need to adapt and include chicken in my diet too (you can be a veggie in Japan, but it’s not easy). At my welcome party in Nagoya everyone wanted me to try the local speciality – tebasaki – and before long I found myself with a chicken wing in my hand. I have to say, although I don’t eat chicken any more, I did really enjoy tebasaki at the time! Surprisingly, there’s very little written about tebasaki online, other than recipes showing how to make it yourself. If you do want to have a go at making it yourself, I would recommend following the recipe on Tess’s Japanese Kitchen. 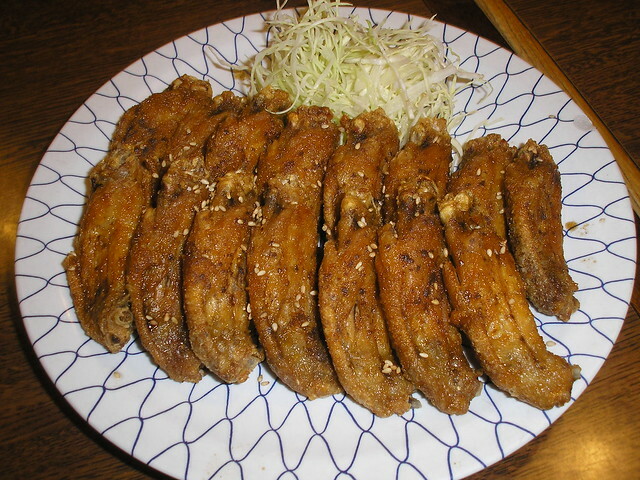 Tebasaki is a simple dish – just grilled, salted chicken wings. They always taste quite spicy, so there might be a bit of pepper in there too, I think. 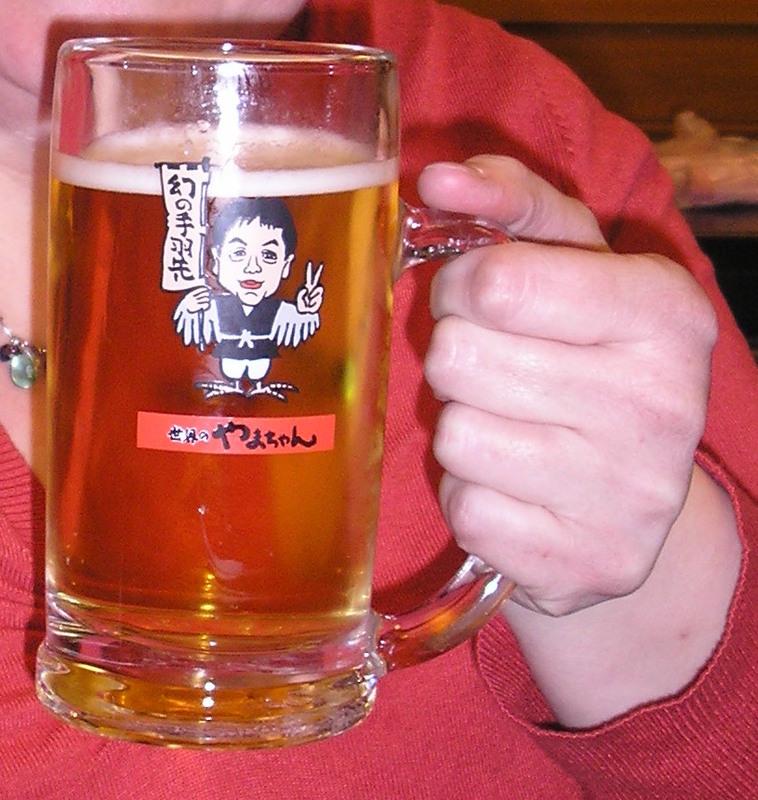 Tebasaki is widely available in Japan and can be found at most izakaya (居酒屋 / Japanese-style pub-restaurants). However, if you want the real thing, there’s only one place to go in my opinion – Yamachan! Sekai no Yamachan (世界の山ちゃん) (to give it its full name) is a chain of Japanese restaurants specialising in tebasaki. Originally from Nagoya, these restaurants can now be found all over Japan. At Yamachan you can buy 5 chicken wings for ￥400 (£2.55 at today’s rate), which is pretty good value I think! Tebasaki go very well with beer, and the salty taste makes you keep wanting to drink, which I guess is the secret of Yamachan’s success! Yamachan’s menu does mainly consist of chicken dishes, but they do also sell other typical izakaya food, such as edamame (枝豆) and all sorts of different fried food. Last time I went to Yamachan I don’t remember them having an English menu, but as you can see in the image above the menu is full of pictures and it’s very easy to order as long as you’re not too fussy. 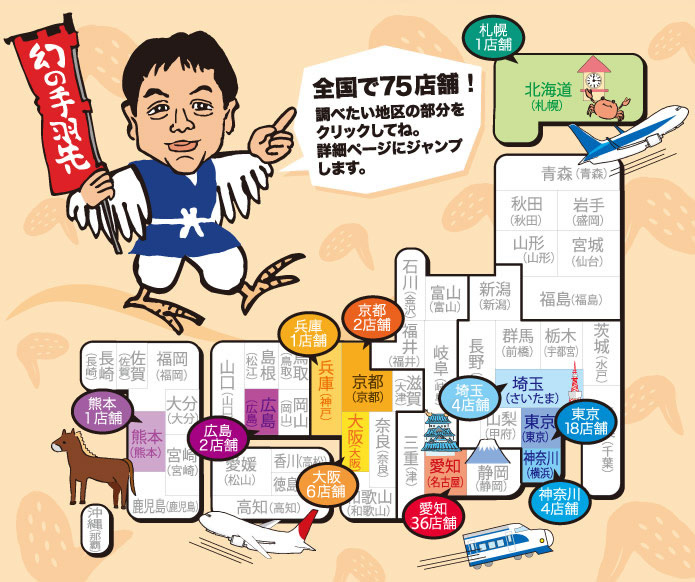 There are currently 75 Yamachan stores across Japan so, if tebasaki looks like something you’d like to try, do try to find one! 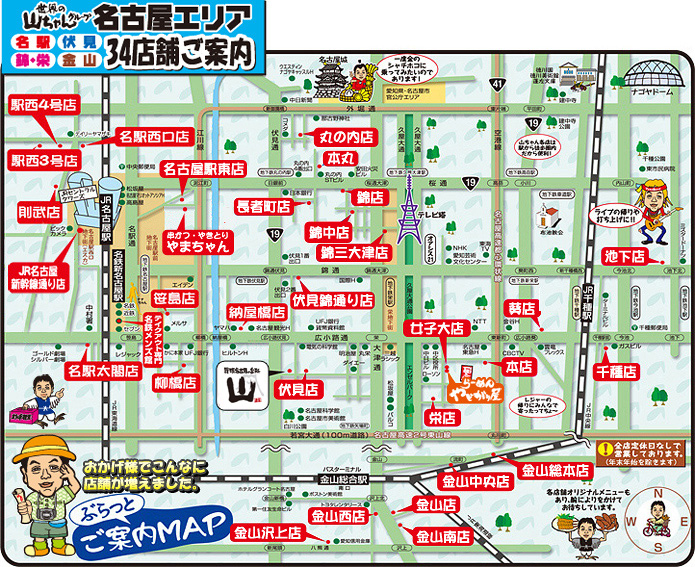 According to the map below, they’re located in Sapporo, Saitama, Tokyo, Yokohama, Nagoya (of course! ), Kyoto, Osaka, Hiroshima, and Kumamoto. Next week we’ll start with と (to), so please leave a comment below suggesting a topic for things beginning with と. Topics can be anything, as long as they are connected to Japan – food, places, people, characters, whatever you want to hear about! Just remember that the words you suggest must be Japanese words. Tokushima, Tokyo, Tottori, Toyama, Tokugawa (Ieyasu), Tonkatsu. I’m sure you’ve written about this before but how about Totoro for your next blog? Totoro – great suggestion – thanks! A great choice this week and one of my all time favourite Izakaya dishes with a cold beer. A few suggestions for next week include: Todaiji (Temple in Nara famous for its daibutsu), Tohoku, Toba (beautiful city in Mie Prefecture on the coast) and Toyama. I haven’t been doing this lately. Too busy. But here are my suggestions. Tokeiji (a temple in Kamakura that was actually a nunnery and is dedicated to the protection of women), Towadako (largest crater lake on Honshu), tofu, Toudai (Tokyo Daigaku), togarashi (chili pepper), tonjiru (pork soup), tobi (bird of prey – kite). When I went to Nagoya, my friend took me to one of Yamachan and ate lots of tebasaki!